Summary: If you want something more similiar to how your regular phone works, then magicjack is the answer. Stop paying monthly phone bills. The MagicJack has all the same features that you are paying for but are free with MagicJack. 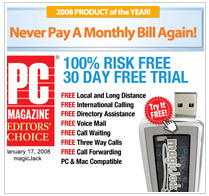 See why MagicJack is our top choice.